Mainstream science thinks that gravity is created by Mass. So an object "creates" gravitational waves. Between "objects" intermediating particles - called "bosons" - are exchanged. So this is a "particle" approach, which is based on the idea that every"thing" is composed by separate particles, which communicate by other particles. So, the universe - and gravity - is based on a discontinuous concept. We think such an approach is fundamentally wrong. We don't believe that gravity happens through separate particles, but we postulate that gravity is an inherent property of a dynamic and non-breakable basic background, namely "elasticity". All what is created by the elastic membrane, is still elastic membrane. 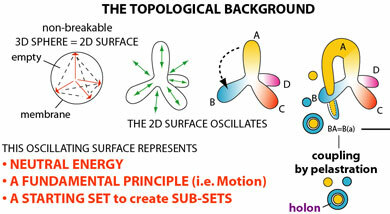 So all holons are sub-sets of the background membrane. Because all objects and beings are all sub-sets of that same dynamic elastic membrane they are interconnected. If one moves, that has an effect on the other. 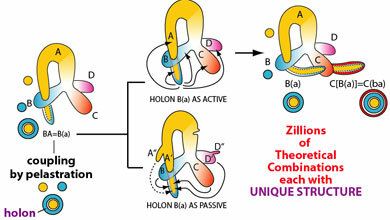 Zillions of combinations can be made by the elastic membrane and it's holons. Because all holons are made of membrane "stuff", they are all elastically connected. Since all holons are elastically connected it's logic that if one moves, this will influence the position or motion of other holons. This is essentially what we call 'Gravity". To Einstein "matter" influences / curves spacetime. He mentally separates matter from spacetime. But, as we show with the holon topology, "matter" itself is restructured spacetime (membrane), so it's logic that it will curve spacetime. And it's logic that the dynamics of spacetime will influence matter. If we separate heuristically matter from spacetime (thus see it as two different things) then we have a problem to explain it. So "gravity" is the elastic (or stress) effect between objects, and thus of their inter-attraction, but it is not a force of it's own. Gravity is the result of the fundamental elastic interconnectivity. Large objects are giant cluster of holons, and the larger they get the more "fixed" membrane is connected together. Therefore larger object will attract smaller objects. In example: Since photons particles (light) are made by very, very flexible membrane they trajectories are influenced (bend) by large objects like proven in Einstein lensing. Another consequence of our simple topology is that the membrane parts, when combined in a holon or in several holons, will have "friction" between them. This friction will create - locally - specific vibrations in the membrane layers which are involved. To us, the observers, this will manifest itself like heat, radiation, nuclear decay, etc. Thus, the four know forces in physics are all specific manifestations of the membrane dynamics. Once we understand the true concept of gravity and the fundamental forces we can easily understand the basic interactions in the physical world (like chemistry, mass/weight, radiation, frequencies, Debroglie pilot waves, electromagnetic effects, electricity, the speed of light, etc.) and in the mental and spiritual world (attraction, aggression, consciousness, etc. ), and even understand the real process of information. 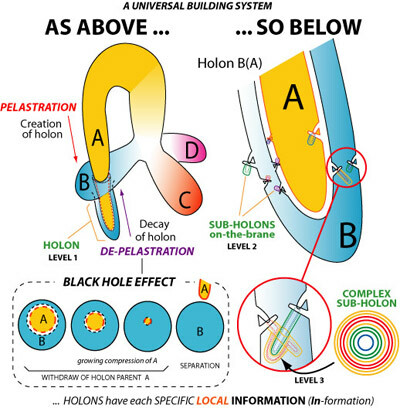 Information is related to the unique structure of each holon. Information = in-FORMATION = internal structure. This is the way information is stored in our brain. In psychology we call that a " mental association", which is a combination of two separate aspects. Two separate aspects are coupled to make a new "information" unit. New information may alter that knowledge-holon. 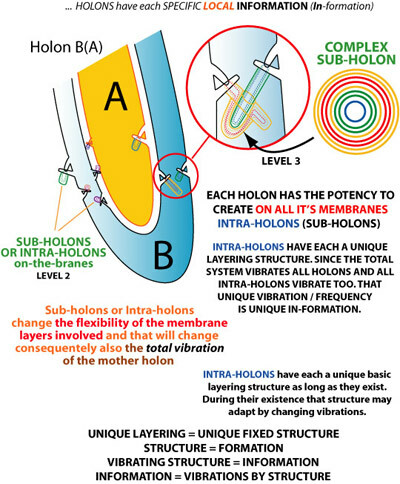 Each holon vibrates in a unique way, dependent from it's parent holons. Now we, the observers, are also holons which will interpret in (our) personal way the vibrations of other holons, so their in-formation. And what about black holes, etc. ? It's related to the decay of holons. In our approach the central membrane peak represents the "Energy" component, and the two covering membrane layers the "Matter Side" (including all their type of conversion systems). On macro level - like galaxies with a central black hole(s), a visible galaxy and an outer halo - we also see these three layers. The black hole effect is the process where the galaxy ( a holon) decays. We see how matter of the two outside layers (matter) go back (are attracted) to the center. So matter is compressed because the spaces it occupies become smaller and smaller. However we may not forget that a galaxy is a giant frame of reference which has on it's membrane layers various type of small holons (molecules, atoms) which are composed of "fundamental particles" (planck holons). During the black hole decay process these fundamental holons decay (de-pelastrate/un-entangle), releasing extreme energies. The release of these energies is a continuous process, not a sudden single event. That's why the black hole process goes together with the emission of extreme energies, like gamma rays and new type of rays, yet to be discovered. So "gravity" is the attractive force in all aspect of our reality, and it is the result of the fundamental (membrane) interconnectivity of our existence. Repulsion is related to the inharmonic properties of holons, like two identical solid magnet poles behave, but also to the way holons occupy "space". This means that holons can "push" other holons away. But repulsion can also be an "attraction" that happens from a different side of the system, and "seems" to be repulsion. Both can explains "Dark Energy". So the gravitational effects between objects (holons) are in fact dynamic re-positioning actions between holons, where stars, planets, moons, asteroids and cosmic dust are all just collections of fundamental particles (basic holons), which are however interconnected. 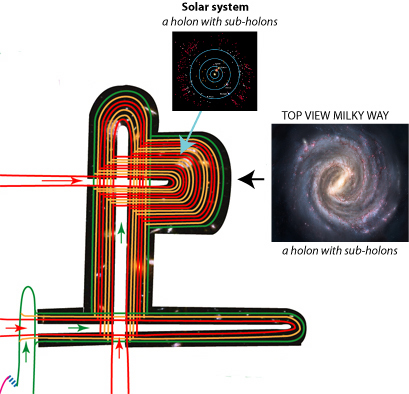 Below is shown an theoretical image of what can be a universe, like our Milky way (a holon). This holon-space can pelastrate on its layers "sub-holons" (like stars and planets). 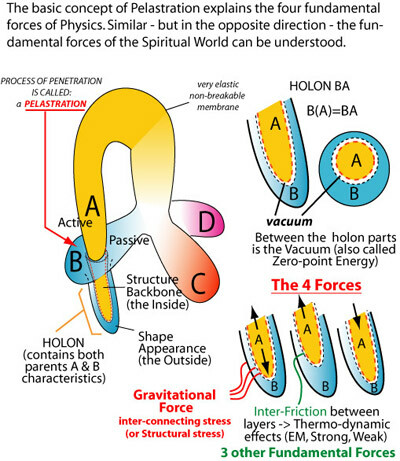 Since all these holons are children of the same universal membrane, all are elasticallly interconnected (thus having a "gravitational" effect between all holons). 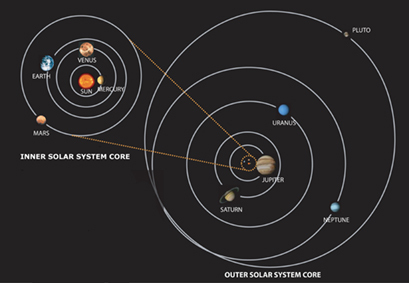 Where in our solar system (a topological holon) the planets, moons and astroids are interconnected sub-holons. Where each planet (a topological holon, being a specific frame of reference) has it's proper type of sub-holons (like sands, minerals, rocks or liquids). IFF the correct conditions are available these sub-holons can pelastrate into more complex sub-holons, like on Earth into molecules, DNA, plants, animals and humans. Since all evolved holons on Earth are created by the basic holons of Earth, they are gravitated to Earth. Where all of them are of the basic membrane "substance" and thus also elastically interconnected by the basic membrane "substance". Thus between all holons and all sub-holons of the multiverse is an attractive relationship, actually called by science: "gravitational". © Dirk Laureyssens, 2002/2011. All rights reserved.